Pick up your fresh fruit from the local market. If something is not available simple leave it out or pick an appealing substitute. 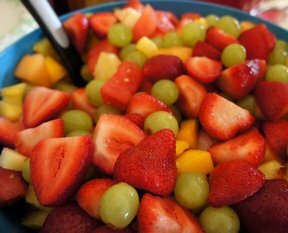 Start by rinsing your fruit under running cold water. 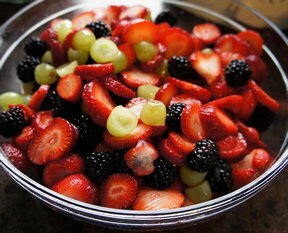 Dry the fruit before cutting. Cut the peach and nectarine in half and remove the pits. Now cut the halves into quarters and then bite size slices. Remove the core and the peel the apple. Cut the apple into chunks or slices. Peel and slice the mango. Discard the mango seed. Peel the orange and divide into sections. Be sure to remove all of the outer membrane. Peel the banana and kiwi fruit and cut into small pieces. Hull each strawberry, then cut into pieces. 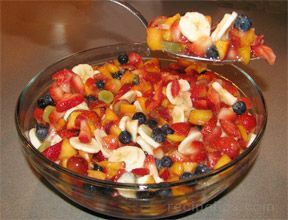 Combined fresh fruits in a large mixing bowl and gently toss. Add orange, lemon and pineapple juice to fruits. Again gently toss fruit to coat. Next transfer the fruit to a glass bowl and chill in the refrigerator.